It was evening there in Uganda, and her fever was rising. And there was nothing I could do but pray. I felt totally and completely helpless. Well, this is a sure sign this child is my daughter, because as soon as I heard the news, the tears started welling up. My oldest boy saw me and asked what was wrong. When I told him, he looked very alarmed and said, “I’m worried, Mom. That’s my sister.” And we all stopped what we were doing to pray for her. Fears of encephalitis, meningitis, sepsis, dozens of other things that can cause piercing headaches and high fevers all ran through my mind. It’s just so hard not to worry about the worst, especially when the one you love is in a third-world country. 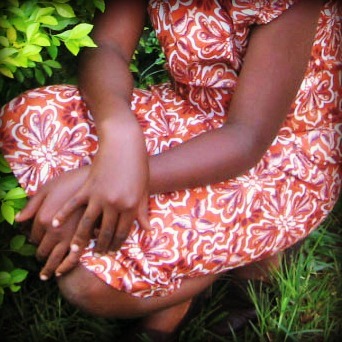 Thankfully, she was able to be seen by a doctor, who diagnosed her with malaria. She’s been on medication and is slowly improving. I’m thanking God for that, and pray that she continues to feel better. But as with all my kids, I won’t really relax until I hear that she’s back to normal. As you can imagine, parenting from so far away is really hard at times like this. I’ve felt such a mixture of emotions the past two days: sadness over her being so sick and alone, fear over complications developing, and anger over not being able to get her here yet. An ever-increased sense of urgency to bring her home. That’s what I want to do. But we’re still so far away from having the funds in place to do it. Right now, we need almost $2000 to hire the lawyer and secure a court date. Then we need $2000 more to pay the rest of his fees, and another $4000 to cover our travel expenses. We’re revamping the store, doing all we can to raise this money. Praying for a grant to come through. Praying for someone to possibly step up and loan us a larger amount so that we can move ahead.